If you want to add an extension to your home that will bring a wealth of space and light, uPVC conservatories could be perfect for you. Adding over £9,000 to your home’s value, they’ll see you make a significant return of investment and give you something extra for your home instead of relocating. With the housing market in recession, many homeowners are opting to stay put and improve their property rather than move. 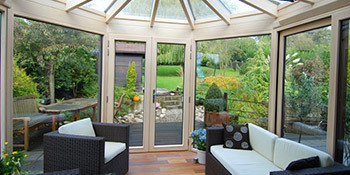 Having a fantastic conservatory installed is a brilliant way to improve your home. uPVC is a chosen favourite in the construction industry, with manufacturers preferring the material over aluminium and hardwood for a number of reasons. uPVC conservatories are brilliant for homeowners on a budget, but still wanting a fantastic installation that will improve the look of their property. Why choose uPVC for my conservatory? uPVC is highly valued as a construction material in the windows, doors and conservatory industries. This is because of a number of benefits not found in other products such as aluminium and hardwood. One of the biggest reasons for uPVC’s popularity is its price. It’s far cheaper than both aluminium and wooden frames, making it a cost effective purchase brilliant for those on a budget. And despite this, it still harbours a number of fantastic benefits including durability and weather resistance. With a uPVC conservatory you can be sure to have something that’ll last well for years without heavy maintenance needed. uPVC won’t rot, warp or bow, leaving it in a great condition for many years to come. On top of this it’s manufactured with stabilisers and additives to protect it from the sun’s natural UV rays. uPVC conservatories are one of the best home improvements you can make to your home, giving you a wealth of space and light. If you want to receive up to four FREE quotes from local, vetted and reputable companies, just complete our quick form and start your journey today. Project: L shape long side 10 feet foundation and double glazed wall and window small wall window and door opposite L shape walls allergy exist want felt roof. Project: Orangery including a kitchen built on back of typical Georgian terrace in north london. Only one company was illustrated by you which l would call very poor on your behalf.. However, Homecare were excellent. Very quick and friendly service. Consultant very polite. Cannot say about value for money as we have not had any other quotes yet. Quotes by email were quick and they responded well to my feedback. Competitive and not pushy- great. We were anxious to find a credible company so it was helpful to find your website. However, Realistic were the only company who responded. But we were so impressed with Ryan that we made the decision to use his company and obviously hope we do not regret this fairly hasty decision. It would have been more ideal if at least one other company had contacted us. Without any effort on my part i recreived a call from verdi and no one else. So i am not being spammed and the only call I did receive turned out to be a winner. The below information demonstrates the energy performance of houses in Uk. Energy ratings vary from A to G, with A being the most energy efficient and G being the least efficient. The Energy Performance Certificate (EPC) rating factors heavily if you want to sell your home, as potential buyers will see just how much they're likely to be spending on their heating expenses. Property upgrades such as insulation assist to considerably improve a home's EPC rating. There are many types of home in the UK and the data below highlights the type of houses within Uk. Over the country the most common property types are typically semi-detached and terraced housing, however detached homes, flats and bungalows are also available. The data below gives an indication to the number of properties in Uk that are central heated and non-central heated. Households are heated by a variety of sources which indicate how pricy yearly energy bills are going to be. Examples of central heating include gas, electricity, oil, solid fuel and LPG boilers. Changing the way in which your home is heated can see you with cheaper bills. The information beneath shows the spread of houses heated by different fuels. Around the UK the most frequent by far are gas heated homes, followed by electricity and then oil. Biomass boilers are also increasing in popularity, heated by green products including wood pellets or agricultural waste.|Properties in Britain are heated up by a variety of fuels, including gas, electricity, oil, solid fuel and LPG boilers. Each fuel has a varying cost associated with it so you can find yourself with less expensive energy bills by changing how your house is heated. Even solar thermal panels are being regarded as by many people in order to lower heating bills for the many years to come.